As Zhang Lu’s book Inside China’s Automobile Factories got published in German in March 2018, we collect material on the book, on auto workers’ protests in China and further texts written by the author. We document the English translation of the German editors preface written for the German version of Inside China’s Automobile Factories. In early 2018, gongchao.org published an update by Xia Nü on the struggle at FAW-Volkswagen: Has the Workers’ Protest at FAW-VW Ended? The strike at Honda in Foshan, Guangdong, that started in May 2010 and triggered a strike wave in China’s auto factories was described and analyzed by Zhang Lu for Labor Notes: Do spreading auto strikes mean hope for a workers’ movement in China? In Inside China’s Automobile Factories, Zhang Lu explores the current conditions, subjectivity, and collective actions of autoworkers in the world’s largest and fastest-growing automobile manufacturing nation. Based on years of fieldwork and extensive interviews conducted at seven large auto factories in various regions of China, Zhang provides an inside look at the daily factory life of autoworkers and a deeper understanding of the roots of rising labor unrest in the auto industry. 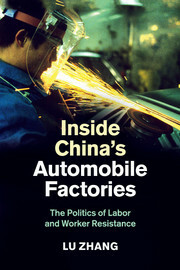 Combining original empirical data and sophisticated analysis that moves from the shop floor to national political economy and global industry dynamics, the book develops a multilayered framework for understanding how labor relations in the auto industry and broader social economy can be expected to develop in China in the coming decades. The English original of the book was published by Cambridge University Press, the German edition by Mandelbaum Verlag.